I wasn’t sure what to expect of these chips. I saw the words “on Fire” which sounded like they’d be spicy, and “Ginger”, so I thought there would be a rather pungent, distinct flavor. According to the bag, these were “Gluten Free”, “Dairy Free” and had “Twice the Fiber of Leading Brand Potato Chips”. Hmm… they sounded good! I opened the bag to avery strong ginger smell, I was scared to taste these. Once I did, the were a lot better than I expected! Crunchy chips, at first some saltiness happens, then there is just a tinge of sweetness, followed by a basic potato chip taste-with the exception of the burning sensation that ginger can provide. These are pretty good! I loved the mild sweetness they had to them, and the satisfying crunch. 1 oz is 150 calories, 6 grams of fat, 3 grams of saturated fat, 18 grams of carbohydrates, 2 grams of fiber, 1 gram of sugar and 1 gram of protein. 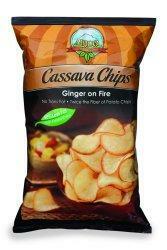 I was provided these chips to try for free from Arico Natural Foods Company. Another fruity post- but this time on COOKIES! 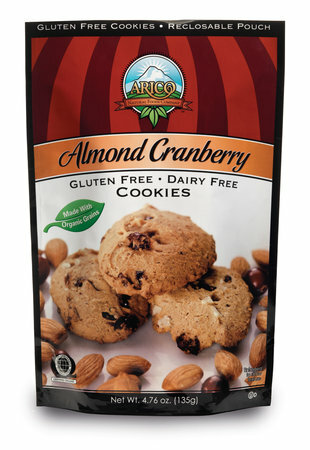 Arico is a company that makes delicious gluten and casein free snacks, such as cookies and chips. They are also all natural, so you can have peace of mind while snacking on these yummy goodies! The company sent me some products to try, like the Almond Cranberry Cookies. I was skeptical at first- I’m NOT a cranberry girl. I hate it at Thanksgiving (plus the jiggly consistency turns me off), and I really don’t like dried cranberries (too tart for me, and often leave a bitter aftertaste). I’ll take raisins anyday- but cranberries? Well, I’m glad I tried this cookie! I took a bite and immediately noticed a nice blend of both almond and cranberry flavor. Normally when you get a cookie that has two flavors, one masks the other. But, both the almond and cranberry flavors were tasted equally- and deliciously! The cranberries were not too tart, but rather a “good” tart. There were little bits of almonds dispersed throughout that added a nice little crunch. The cookie part was actually buttery and rich tasting, and it also had a brown sugar flavor as well. Overall, a yummy cookie! They are a bit small, maybe a little bigger than an Oreo-brand cookie, but still delicious nonetheless. I would give it 4 stars, and would probably buy them again. I also like that 2 cookies provides 3 grams of fiber and 15% daily calcium needs. Woop! 2 cookies is 100 calories, 4.5 grams of fat, 15 carbohydrates, 3 grams of fiber 7 grams of sugar, and 2 grams of protein. Flour base (organic brown rice whole grain flour, rice starch, rice protein, baking soda), organic cage free eggs, organic cane sugar, almonds, organic almond meal, organic agave nectar, dried cranberries (cranberries, sugar, sunflower/safflower oil), chicory extract, organic palm oil, calcium carbonate, organic sunflower oil, natural flavors, sea salt.